Timberlake is the only artist with two songs in this week’s top ten, and I guess it’s no surprise: The 20/20 Experience was blowing up and getting a ton of people excited a year ago. “Suit” would spend two weeks at #2 after a quick rise up my top 40 and fell as the hype trailed off. In January, it won a GRAMMY Award for Best Music Video, directed by David Fincher. After missing my chart two years prior with “Honey, Let Me Sing You A Song”, the Florida singer and songwriter entered onto my chart with this single, co-written and produced by the duo Espionage. They’re responsible for big hits on my top 40 for acts like David Cook and Train. He’s now independent and just released an EP, Heartache Machine, this month. In 2013, this trio rushed to the top of my chart with three consecutive singles (“We Are Young”, “Some Nights” and “Carry On”), and while this song received a video treatment, it never ended up getting serviced to radio. As a result, it didn’t quite do as well, rising to #6, but that’s still significant. Member Jack Antonoff is currently promoting a new project, Bleachers. He’s a one hit wonder to most audiences, and “Bad Day” may forever be his best performing single on my chart, but Powter is still raking in the hits when it comes to my survey. The now 43-year-old singer from British Columbia has entered a total of ten times, with this climbing to #3. Powter has been writing with various collaborators for his latest effort since March. The quartet from Cambridge, MA wasn’t exactly on my radar when debut album Manners hit shelves back in 2009, but go forward several years to 2012’s Gossamer and we see quite a difference. “Carried” remains the band’s biggest single on my chart, spending two weeks at #4, a better peak than the #26 achieved by “Take A Walk”. They have yet to rank since then. Here’s the second of two songs from the former Mouseketeer and *NSYNC member. “Suit & Tie” may have provided that nice throwback sound, but “Mirrors” took us into the present with a contemporary R&B sound. It landed at #2 on the Hot 100, the same position it peaked at on here for three weeks. A third single from his album, “Tunnel Vision”, failed to enter. Combining the forces of two #1 artists on one emotional duet is grounds enough for yet another #1 single, right? No shock here; “Reason” took over the top spot for five weeks, becoming the biggest collaboration of the year. 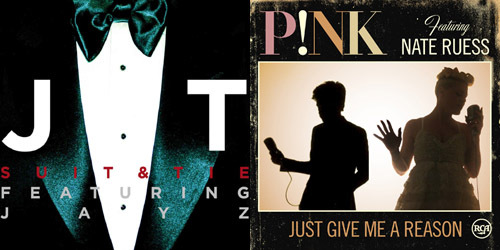 In fact, the song was the third of four singles to reach the top two from Pink‘s 2012 album The Truth About Love, a pretty impressive chart feat. Taking a big leap of six notches from #9 is the song that would end up being my #1 single of the year 2013. “Go” held a grip on the weekly throne for twelve weeks in a row, the longest consecutive run for a male soloist in my top 40’s history. That is one extended stay. Though it wouldn’t break in the United States until later that year, it did very well at radio and retail. In 2011, this sextet from Los Angeles took a long ride up to #1 for a week with their first big radio single, “MoneyGrabber”. Though the band claimed one of my favorite albums of the year with More Than Just A Dream, “League” didn’t experience that wish of another chart-topper, holding at #2 for five weeks. Followup “The Walker” also peaked at #2 for three frames. Leading the chart for a third week in a row was the fourth song to reach that coveted spot for the Canadian crooner and the leadoff cut from To Be Loved, which was certified Gold. “Beautiful” was co-written by Bublé, Alan Chang and Amy Foster and produced by Bob Rock. Though it wasn’t nearly as big as “Haven’t Met You Yet” on a global scale, it did grab its usual airtime at both AC and Hot AC radio here in the States. A re-release of the album with an added DVD is available Tuesday.